It looks like two boughs had grown closely together, so much so that the bark overlapped and fused them together. When the other bough was chopped off, it looks like part of it was left behind, still attached to the remaining limb. 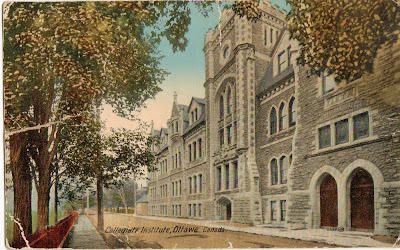 I bought this postcard at an antique show some years ago, a coloured print of Lisgar Collegiate Institute, the oldest school in Ottawa. 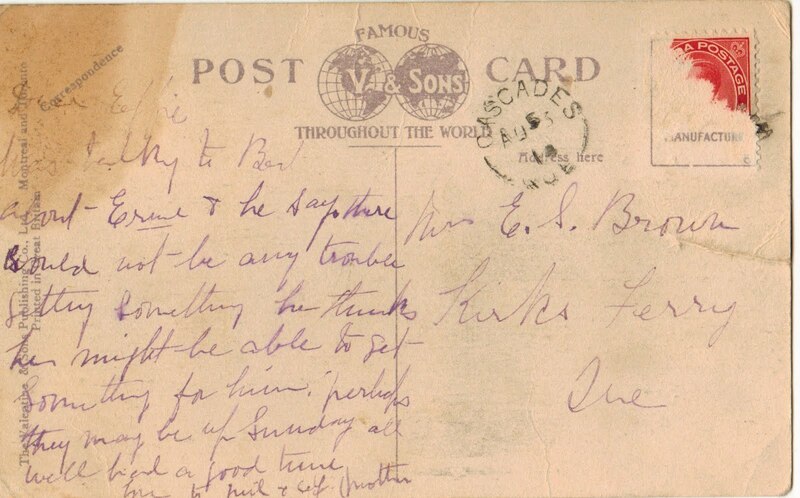 While the date is hard to read, I think it says August 1918. Back then, the street continued straight past, and of course the 1960's south building hadn't been built yet. This isn't an identical angle, but it's close enough to notice many changes to the roofline, not to mention the skyline behind it. Still, much of the building has survived well through many trials, including a fire in the 1890s and the major renovation in the 1970s. 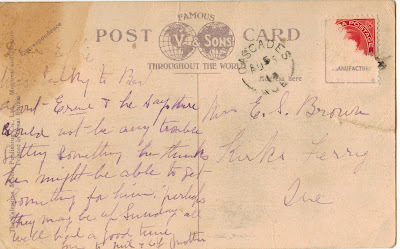 It was addressed to Mrs. E. S. Brown of Kirks Ferry, Quebec and stamped at a post office in Cascades, Quebec. Perhaps you've also stood at the corner of Elgin and Queen and marvelled at the geometry of the intersection. It's a large area dedicated to vehicles, smack dab in the middle of downtown Ottawa. If you're a cyclist, you've also probably cursed the potholes, too. The entire length of Elgin Street was resurfaced this year, and this intersection was naturally repaved as part of that project. With fresh smooth, black asphalt, not yet marked up with dashes, the intersection looks even more vast, and the blacktop continues down both sides of Confederation Boulevard. Back in October when the Occupy Ottawa protest was still well-established in Confederation Park, I went by a couple of times to see what there was to see. Someone with a generator, bucket, and various tools was at the NCC's miniature bronze map of downtown Ottawa-Gatineau. The more tourist-oriented streets appear to be brass, and this person was cleaning them with a Dremel and various abrasive sponges. I didn't realize she wasn't with the protesters, as a gasoline generator and water jugs was the kind of thing the protesters would have with them. But it turns out she works for the firm of the original artist, which was hired by the NCC to do some cleaning and updating some features on the map (like adding the new Convention Centre and removing the Capital Infocentre). I chatted with her briefly, but unfortunately it's been too long for me to remember any noteworthy details. I was told that many farmers couldn't make it because the December market dates were scheduled after they had planned their planting seasons. Nevertheless, there were nearly 100 vendors last time! In related news, the Glebe's roadwork is finished for the season, and Kettleman's, the infamous Glebe bagel shop kitty-corner from Lansdowne Park, is back open after closing for renovations a few weeks ago. Be forewarned, though: walk, bike, or maybe bus there. The traffic on Bank Street (and, for that matter, inside Kettleman's) is quite heavy! Nevertheless, support local farmers, artisans, and businesses by making a quick trip to the nearest farmer's market to Centretown, and the last one at Lansdowne this year. As always, admission is free to the Lansdowne Market, but parking is in effect. They will exchange your parking chit for a $5 voucher at the info table if you do manage to drive there. Recently, work started on phase two, the first public inklings of which were two years ago, and the plans for which have been approved virtually unchanged from the early pre-application renderings. They've had to remove the Bank and McLeod bike cutout, and have installed some scaffolding to protect the pedestrian passage, which gives the impression that it goes on and disappears into nothing. One of the fun things about having an archive of hundreds of photos from each of many construction projects in Centretown is that you can use it to tell when a particular photo was taken by somebody else. I made a reference to it in this post about Tommy & Lefebvre's reconstruction, when I pointed out that if you look at the site in Google Street View from one street, it's at one point in the project, and from another street, the photos are from a few weeks on. The last temporary building, a.k.a the "Justice Annex", is slated for imminent demolition. The federal office building, built during World War II to house federal workers, was last occupied in 1998--the same year it received federal heritage designation. These are its side doors. I have other photos of this building, some of which were used by URBSite in its posts about the building and about the temporary buildings more generally. Public Works and Government Services Canada (PWGSC), the agency responsible for maintaining federal buildings, has decided that it is too expensive to repair this building, and instead will demolish it. This reminds me of some quips made earlier this year that it would be cheaper to demolish and replace 24 Sussex Drive than the estimates to repair it (thankfully, I no longer find any such references). The CCCA has written to Public Works and MP Paul Dewar to oppose the demolition of this building, as has Heritage Ottawa in a letter supporting the CCCA's position. This is the last of the wartime buildings, and its loss will remove a reminder of the enormous effort that went into fighting the war--even on the home front by the civil servants who worked in these buildings. It is inevitable that veterans will eventually die, but buildings can be repaired and maintained. It is quite a disappointment that we will lose this heritage. The Centropolis condo building under construction has had its share of controversy. Settling that has rendered the neighbouring building uninhabitable has been the most controversial, but I've been frequently frustrated by the debris, dirt, mud, gravel, and other obustructions strewn through the neighbourhood. So with all that, I just had to laugh when I saw this. The City of Ottawa made a big ballyhoo in December 2009 about our official population reaching 900,000. They made a media event when they rolled out the new population signs announcing it. I was even lucky enough to see the City's sign shop making the numbers for these signs. 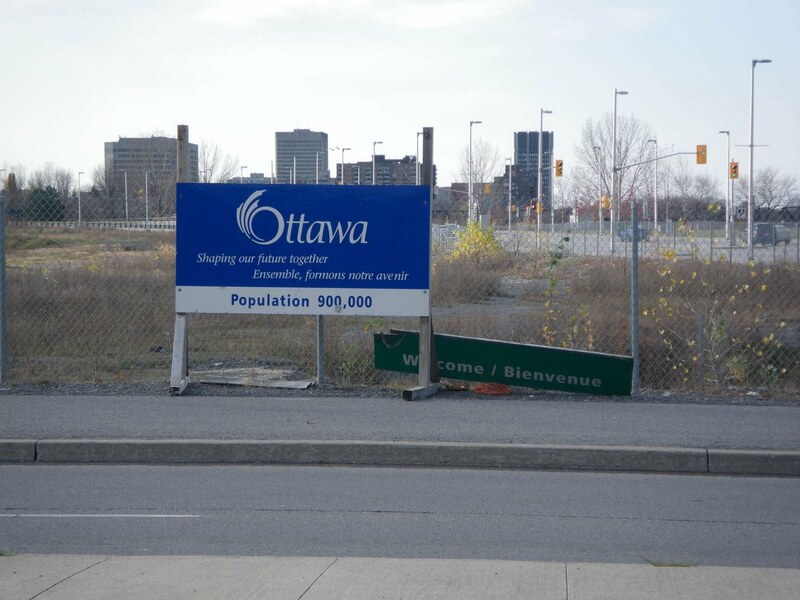 Alas, the temporary wood frame that was used for the sign on Booth Street in Lebreton Flats, for people entering Ottawa from Gatineau, was never replaced with a permanent structure. Parts of the sign have fallen off, and the sign itself has been literally pushed aside, oriented so that few will actually see it. In late June the local media covered the conflict among the residents. As I recall (I can't find any articles online), the parking garage had to be repaired, and there wasn't enough money for the condo board to completely reinstate the gardens above them, which were the only greenspace of such a size right in the downtown core, particularly for a condo. I tweeted a photo of the gardens after they'd been marked for demolition back in July. Well, they've cleared out the gardens, done the various repairs, and are starting to rebuild the brickwork, including some four- to five-foot high walls that demarcate the pedestrian access to the building. The walls are thick, but evidently hollow. The wide stones to cap them off hadn't been installed on this section when I went by. If you've ever wondered what was inside those walls, now you know! Last Thursday was the City's public open house for the reconstruction of Bronson Avenue. Well over 100 people attended, but information is wanting for people who couldn't attend. The project website is supposed to have information up today (Edit Tuesday: RescueBronson.ca has posted the English slides), but even so, they say they want comments in by Thursday, so that they can issue an RFP in three weeks, and begin construction as early as February 2012. Clearly, there are little or no plans to change the scope of the project based on the "consultation". So Rescue Bronson—again—is picking up the slack. 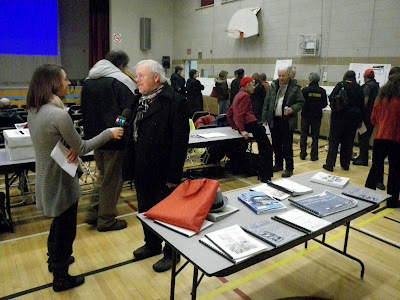 We've published a collection of links to coverage of the Bronson open house, which includes some information on the project plans itself. Eric Darwin features in much of it, and his dedication is much appreciated. I also recorded the entire staff presentation and Q&A session of the open house, and you can download the mp3 here (99 MB) (Edit: sorry, the upload wasn't working. It's an hour and 48 minutes long, and a very large file; hopefully someone can find a way to embed or stream it so you don't have to wait to download the whole thing. I've also typed up a transcript that you can access as a Google Doc, or view it below. It isn't verbatim, and there is some interpretation, but gives a good idea of most of the discussion. There are timestamps so you can skip to the part of the mp3 that you want to hear. 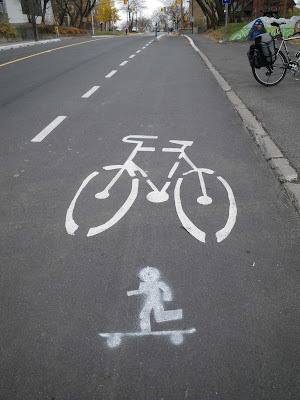 Someone spray-painted this in the Laurier Segregated Bike Lane. I knew the cycling lobby was getting ahead, but the skateboarders too now? (Uphill, no less) The pedestrians really ought to catch up soon! 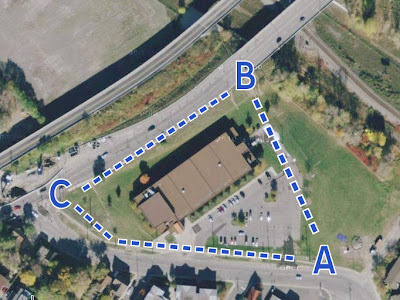 After a handful of meetings of the Public Advisory Committee (PAC) for the imminent Bronson Avenue reconstruction, the city's project managers and engineers will be presenting their plans to the public next Thursday evening at Centennial public school, 6:30 pm. All are welcome to come and share their feedback. More details are here on the City's website. Much has been done behind the scenes by community representatives on the PAC to squeeze out every last bit of improvement in the plans, and you can help increase the pressure by signing the Rescue Bronson Avenue petition. As you will recall, community groups united under the banner of Rescue Bronson Avenue to fight back at the engineers' assumption that the road should go back exactly as it is, except with wider lanes. Here's a sign in Chinatown on Somerset West just east of Booth Street. I think it had a companion that has been removed. The post itself is metal. It looks like it might be an old streetcar post. It's quite easy to walk all around Centretown and not pass by this monument on the Mackenzie-King Bridge to Canada's fallen in the Korea between 1950 and 1957. On the front of the statue is written "We will never forget you brave sons of Canada," and inscribed around it are the names of the 516 Canadians who died in that conflict. The monument was opened in September 2003 by then-Prime Minister Jean Chrétien and Korean ambassador Chang Hi-Ko. It was designed by Vincent R. Courtenay, a Canadian Korean War veteran, and sculpted by Yoo Young Mun. In front of the monument is a plaque describing the significance of the imagery (click to view full size). The children are carrying maple leaves (symbolizing Canada) and roses of Sharon, the national flower of Korea. The edges of the plaque and the monument are connected by two rows of pavers that meet at a point. According to the plaque, the resulting angle points in the direction of Busan, South Korea, where an identical monument sits at the site of a United Nations memorial cemetary that contains the graves of 378 Canadians. The names wrap around to the back of the monument, where additional relief repeats the English moto banded around the front, and an inscription on the stone indicates that the Korean Granite plinth was provided by the Government of the Republic of Korea. You'd think it would be easy enough to get from point A to point B, but sometimes in Ottawa you have to go through point C to get there. I don't mean this metaphorically, but literally. In the diagram below, desire lines (a.k.a. "cowpaths") indicate that pedestrians want to get from A to B, but the sidewalk directs them to go from A to C to B. It's actually worse than this, which is why I'm showcasing it as an example for Diane Holmes' Sidewalk Summit, this Tuesday at 7pm at City Hall. The story starts at Tom Brown arena in Hintonburg, where Albert and Scott Streets meet on the west side of the O-Train tracks. Last Tuesday, Citizens for Safe Cycling had its Annual General Meeting there and bike parking was at a premium (many had already left by the time I took this photo. At one point, every bench, tree, and signpost had a bike locked to it). A bit over a year ago, the Chinatown Gateway Arch was officially opened, and around that time I wrote a post chronicling the construction process for the arch. Since then, there has been a bit more change. Mayor Watson decorated City Hall's heritage building (which is the part of City Hall that houses his office) for Hallowe'en, and it looked great! It appears that I only have one previous Hallowe'en-themed post, which also included a photo of City Hall, back from the first year of this blog. Sorry for the gap in posts; I've been busy at a conference, and getting settled in to my new job. In case you hadn't heard the news (or the Buzz), I stepped down last month as president of the Centretown Citizens Community Association to take a job in the office of Councillor Diane Holmes. Two weeks ago I was busy at a conference and didn't have time to prepare any blog posts for last week, which was my first week at the new one. A complicating factor is that I'll be part-time at both, and the transition is a bit time-consuming. Nevertheless, I already enjoy being back on Elgin Street, after my office moved away last year. Commuting to City Hall will give me a chance to cross the neighbourhood a few times a week to keep an eye on things, and keep my camera on them too. Similarly, commuting to my West office will have me crossing Bronson Avenue a couple of times a week and keeping an eye on Chinatown, Little Italy, and the rest of the former Dalhousie ward. It's a lot to handle, but keeping all those balls in the air is a challenge I'll enjoy. You've perhaps walked by the little fenced- and hedged-off lot at the corner of Florence and Lyon and never given it a second thought. It's next to the little Ottawa Hydro transformer station on Lyon just North of Bay. I'm out of town this week, so blogging may be spotty this week too. While the bike racks on Bank Street see a lot of use for cyclists, there were mixed responses to the City's one-percent-for-art policy went to street furniture instead of standalone art. Thanks to sunlight, these racks take on a second life casting shadow images on the sidewalk. And even though it's only fleeting art, it will never wear off the pavement like paint or inlaid pavers would. It brings up an interesting issue. They tried widening the sidewalks on Bank Street in the '70s (they even closed off some cross streets, like Lewis), but the space reclaimed from the roads was filled in with trees and rock gardens. So when it was brought back to the state that preceded the 2006-2010 reconstruction, it was a no-man's-land that could be used to relieve traffic, not a space stolen from pedestrians to feed the traffic monster. This is one of the problems faced by the percent-for-art programme in downtown road reconstruction projects. By adding art to the streetscape, you take away walking space that is often quite scarce. Many other items, like garbage bins and newspaper boxes, already compete for sidewalk space, and efforts to moderate their collective impact have not gone far. One reaction is to incorporate the artwork into these inevitable fixtures, like the bike racks on Bank, or the streetlamp art proposed for Somerset Street West. Pedestrians aren't entirely forgotten; they are thrown the occasional bone. There are many good things said in the Ottawa Pedestrian Plan, and in addition to the Plan itself, some sidewalks get repaired or improved as part of multimillion-dollar road reconstruction projects (like those on Bank, Preston, and Somerset). But this won't address most pedestrian problems in a reasonable timeframe. Just like the trend in cycling (until very recently), the City doesn't put much money toward pedestrian-specific repairs to fill in the missing links that aren't part of these major reconstruction projects. With all the new condos residents moving in downtown—most not owning a car—the pedestrian network needs to be able to support and attract people who use their feet. Then there are the things that don't even stay the same. Fences were recently installed along the sidewalks on Albert and Slater, redirecting pedestrians' natural flow (a problem faced by suburbs also). When the Laurier Segregated Bike Lane was installed this summer, pedestrians lost their dedicated advance signal at Bank Street (and pedestrians outnumber all other modes at that intersection) and the new left-turn arrow at Elgin for motorists coming off the Laurier bridge puts a convoy of vehicles in the path of pedestrians trying to cross. More recently, the NCC blocked off a pathway connecting Preston and Lebreton Flats residents to the Ottawa River. Now that I'm working in Councillor Holmes' office, these pedestrian facility degradations are one of the things I'll be looking at. And while I know of some of them in Centretown, your help is needed to identify other degradations across the city. So pedestrian advocates, please tell me: where has it gotten harder to walk recently in Ottawa? Leave a comment in the box below, or e-mail me at centretown.ottawa at gmail dot com. It feels like I took this photo just a few weeks ago, but it was actually June 2010. The street we're looking down is Lewis (my favourite stretch along my now-famous shortcut), and the cross street is O'Connor. Like Kent Street, the one-way traffic on O'Connor travels pretty darn fast when it gets the green light. Both O'Connor and Kent were widened decades ago to be very close to the buildings, leaving little room to see around the corner when you're at the stop sign on the cross street. I didn't see the collision, but I suspect this is what happened to the unfortunate driver of this sedan: he looked as far as he could up O'Connor for a gap in traffic to cross at Lewis, and was slammed by the SUV coming down O'Connor far enough away but going fast enough (not necessarily speeding) to not be visible from the side street. This was a common occurrence on Lyon Street before the speed humps were installed on it. 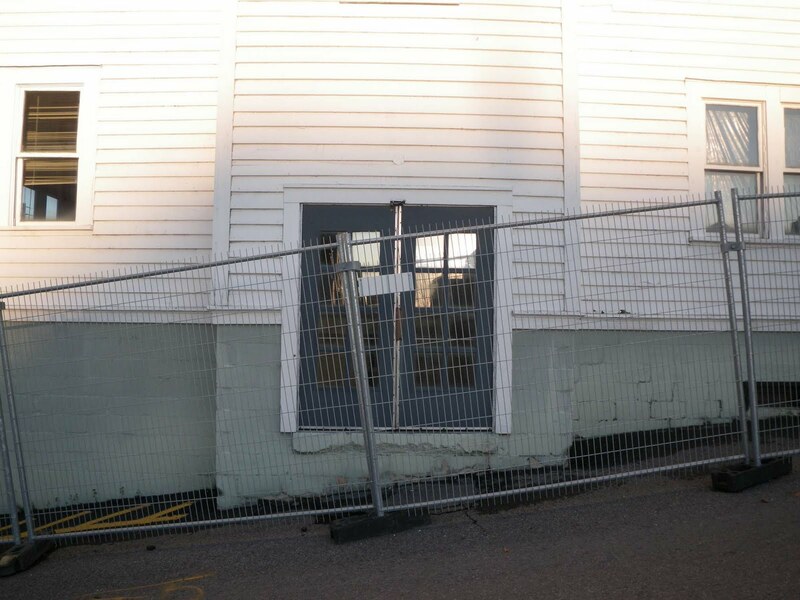 The traffic engineers were up in arms at the thought of speed humps on an arterial road, but so many cars had crashed into the house at the south-west corner of Lyon and MacLaren that the community had had enough and political will overruled the engineers. Now Lyon still carries lots of traffic, but that traffic is calm enough for a bike lane to run alongside. The Centretown Community Design Plan suggests looking at converting Metcalfe and O'Connor back to two-way traffic. The plan's consultants have suggested this (as well as the rest of the transportation aspects of the CDP) be investigated as part of the Downtown Ottawa Mobility Overlay, a.k.a. Downtown Moves. Now that the DOMO and its terms of reference are out, we see that Centretown isn't part of the core study area. We'll see how many resources, if any, go toward looking at the one-way streets. In the meantime, when you're crossing Kent and O'Connor on a side street, either on a bike or in a car, be careful! Before I start, you may have heard the news that I've stepped down as President of the CCCA to work in the office of Somerset Ward Councillor Diane Holmes. I sent a message to the CCCA's members and followers on Wednesday night. If you're wondering, yes I'll still be blogging, yes I'll still be involved in community activities (perhaps even moreso), and yes I'll still be tweeting. I still want you to join and get involved with the CCCA, and to attend the AGM on October 25, 2011, at 7pm at the Beaver Barracks (464 Metcalfe, at Catherine). I won't be working regularly at City Hall until the last week of October. I've written many posts about the City's insufficient provision of secure bicycle parking, particularly in the removal of parking meters. About a year ago, I gave the example of Elgin Street, which went from having many parking meters per block, per side, to one or two post-and-ring racks for both sides. Back before they even started, I'd reviewed the City's list of where to put the bike racks that were left after removing most of them. In addition to noting locations where it was recommended not to replace parking meters, I also pointed out that bicycle parking shouldn't be limited to commercial areas and big condo buildings. I've often arrived at someone's place in Centretown to find that there was nothing in sight to lock my bike to, not even a street sign. That's for short-term parking. It's even worse for many apartment-dwellers, like the ones along Frank street whose bikes were parked in the video in this post, and who don't have space in or outside their building to keep their bikes. What I suspect happened here is that someone unbolted the sign and lifted the bike over the post. Another related trick thieves use is to find a post that can be lifted out of the ground, so make sure to immobilize your wheel (i.e. don't just lock the frame to the post), and check to make sure whatever you lock your bike to is securely attached to the ground. The number of bikes in town has grown significantly, even since last year, and these people need places to park their bikes. I've been told that a second round of post-and-ring racks is being installed soon (perfect timing given the imminent removal of the blue Velocity bike racks for the winter), and that Elgin is one of the streets that will receive them, after its recent resurfacing. Whether this will include residential areas, I'm doubtful, but if there are people or stores you normally visit that have no secure place to lock your bike, please leave a comment! The Transitway stop at Metcalfe Street on Albert Street is under construction, so a temporary one was installed on the West side of Albert Street, outside the World Exchange Centre. A waiting platform was built out into the curb lane with asphalt and temporary curbs. What really struck me in this picture, though, was the little sign on the far right. It's a "no passing" sign, necessary due to the lane restrictions (in fact, I'm surprised parking is still allowed in the left lane). This photo was taken during mid-day, but I can guess that that sign wouldn't be visible to its intended audience--presumably, people in the lane that's on the left of the bus lane. If there isn't a truck parked in front of the sign, the rush-hour bus convoy will certainly block it. A week or so ago, I was heading down Bank Street in the Glebe, taking some photos of the construction, when out of the corner of my eye I saw this kid tap the recently-poured curb with his skateboard. I figured he was trying to tell if it was hard enough for him to step on it to get to his friends. Then he picked up a piece of gravel, which I figured he was going to toss, as boys do. Instead, he bent down and started scratching something into the not-yet-hardened curb. Since I was taking photos anyway, I conspicuously aimed my camera at him and took his photo (as you can tell, I've blurred his face). That got him to stop, and hopefully he's learned his lesson and won't do it again. Small planes over Centretown aren't that uncommon; there is a regular route by a historic biplane that does tours from the Aviation museum and for $100 they'll take you all the way downtown (I'll have to try that myself some day). This one was flying behind the crane at the demolition site of the Lorne building on Elgin street. 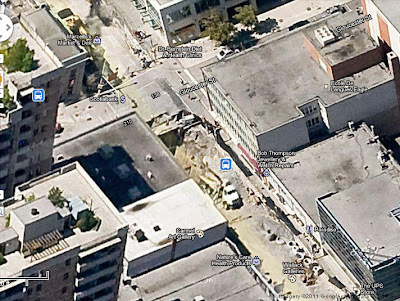 I wrote a post on the context and history of the Lorne Building in October 2009. Well, the City of Ottawa has been on a roll, fixing up a number of problems that have been on my list for a while, including fixing the potholes on Lewis and the sign at McLeod and Bank, as I blogged recently. Those were both nuisance issues, but one true safety problem has been fixed: the lack of crosswalk lines at Somerset Street West and The Driveway. To recap, this was perhaps the only stop sign in Centretown that wasn't accompanied by a stop bar and crosswalk lines, depriving motorists of an important cue to give right-of-way to cross traffic (including pedestrians and cyclists). I'd been nearly hit on my bike by a motorist who stopped at the stop sign, but blindly started again without registering that I had the right of way along Somerset (thanks to my yell, he braked hard and his bumper just tapped my front fork). In this photo, it looks more like a laneway to motorists coming from the right. I'd noticed this past spring that the lines at the nearby intersection of the Queen Elizabeth Driveway and Somerset West were faded, suggesting that the city would be repainting soon. A prime opportunity to add crosswalk lines to The Driveway (the near intersection in the photo below). And this was the gist of my April post on the subject, which I forwarded to City Hall. You can sorta make it out in that picture, but it's much clearer in this crop of a photo from August: the door on the 24th floor coming out the side of the building, which Eric refers to in one of his above-referenced WSA posts. As he mentions, it was used to access the inside of a former illuminated sign on the side of the building, in order to replace the bulbs without having to hoist a crane. The following message was sent to the CCCA's e-mail announcement list early this morning, announcing upcoming events. Contact ccca@centretowncitizens.ca to be among the first to receive CCCA e-mail updates a couple times per month. I hope you did a lot of resting up over the summer, because September is starting up at full speed! While visiting family overseas at the end of August*, I digitally scanned the photo albums so I could have a copy. Since my grandparents had been stationed in Ottawa in the mid 1970s, some prominent Ottawa landmarks made their way into the background of some of the photos. In my September 2009 post about bike cutouts at traffic diverters, I finished the post with a description of the then-incomplete bike cutout on McLeod at Bank. Normally when I think of fog in the city, it's just around. This image really shows that fog isn't necessarily shapeless. And in case you're thinking I might have had a cloudy smudge on my lens, this one seals it, taken two and a half minutes on. The left tower now looks cloudy and the right one clear, suggesting the fog didn't expand much after passing through the gap between the buildings. In other words, whichever side I'm standing on, the nearer tower is clear and the further tower is obscured by the wall of fog. 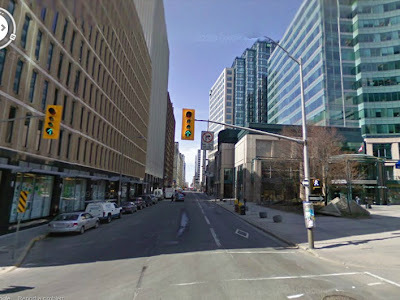 You can also (not) see the Mondrian at Bank and Laurier at the left. It was quite serendipitous that I saw that house and decided to take a photo of it, because I obviously didn't realize the fog would roll in just a few seconds later. I was intrigued by the stark contrast of this little residential house sitting in the middle of parking lots, highrises and apartment buildings. By the way... as I write up this post in early August, I don't know when I'll post it. Hopefully it's a hot day, and the reminder of the miserable winter helps you appreciate the heat. Do you remember back in March 2011 when I complained about the potholes on Lewis Street between O'Connor and Bank? And this is what they looked like in March of 2011. The water had flushed the patches clean out of the holes, which were back and bigger than before. Well, good news! I'd forwarded a link to that blog entry to some folks at City Hall, and though I didn't get any reply to those e-mails, we've finally gotten some results. As I had suggested, the City scraped off a chunk of asphalt and laid a good solid strip down where these potholes were. This method worked at the Bank Street end of the block (as I had suggested they do when putting the final layer of asphalt on the Somerset to Arlington stretch of the Bank Street reconstruction in 2010), and has survived seamlessly through the winter since. Now I don't have to worry so much when I lean my bike to turn onto Lewis from O'Connor! O'Connor-Lewis-Bank-James-Lyon is a very convenient bike route for going south-west through Centretown, because it has low traffic and few red lights. City Council hasn't met for a couple of months, as City Hall for the most part goes on summer holidays. It'll be back in September, which is just around the corner! I generally avoid Kent Street, as it's not a very people-friendly place ever since they widened it and cut down the trees for the introduction of trolley-buses. The downside of this is that I miss little gems like this foursome of old houses between Somerset and Cooper. It looks like they were all built as exact duplicates of each other, and many of the original features have survived, despite each house taking on its own unique identity. The Centretown Traffic Calming Plan (an electronic copy of which apparently does not exist) has made Kent a bit more hospitable to use, the little bulbouts and dying trees aren't enough to make it actually look nice.